The only way to know if something fits right is to try it on, and I just came back from a four day shopping spree. In four days I went "shopping" at seven colleges, trying to figure out what I did and didn't like about each. As a high school sophomore, I already have a good sense for what I'm looking for in terms of size, setting, academics, and atmosphere. This trip made me quickly realize how important it is to consider school size. Really, deciding between a small college and a large university is similar to deciding whether I want to shop at a local boutique or a big name store. I have to ask myself: do I want a big lecture hall with 100 students, a small classroom with one on one time with the professor, or something in the middle? Do I want to meet new students everyday or do I want to feel like I know my classmates? Being able to see the halls and classrooms in person helps me cross off and add on different colleges on my list. As for the setting, I visited schools that where urban, suburban and, yes, even rural. Georgetown University is urban, yet had a small town feel; University of Richmond is suburban with a southern, stately feel. Choosing the right setting for you is all about comfort and preference. This trip made me realize that I prefer a college in a more suburban setting with designated campus. While my opinions may change, having a perspective of location again allows me revise my “shopping” list. While the aesthetics appeal is nice, what's really important is the quality. Finding schools the that excel in areas that I’m interested in, and that have majors and courses that will inspire me, is important. From the liberal arts to career-oriented education, having a sense of all the great options available inspired me to work harder to be accepted to my dream school. The aspect that really stood out to me while on my trip was the vibe of each school and its students. For example, at the United States Naval Academy there are rules, lots of rules. At University of North Carolina - Chapel Hill there is big spirit that permeates the campus. 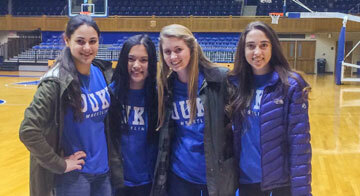 Duke University felt extremely traditional. The best thing about visiting schools is that you have the opportunity to get a real sense of the people and the community first-hand. My college road trip let me take a step forward in my search for the schools that would suit me. My dream school would consist of a traditional feel with suburban setting, and a medium to smaller sized student body. As for the academic part of selecting colleges, I am unclear of what I would like to pursue at the moment, as I’m sure many other students are as well. I'm excited, though, to have figured out what I'm looking for down the road as I apply to schools. A college education is a big investment. Make sure that you take time to shop before you decide!